Another person has thrown their hat into the ring for the gubernatorial seat in Maryland. Harford County Executive David Craig announced his Republican candidacy at his home in Havre de Grace Monday morning. He has previously served as the mayor of Havre de Grace, as well as a state delegate and senator. The Republican has been county executive since 2005. Craig says he would like to reduce the state's 6 percent sales to ``at least 5 percent.'' He also says he would like to eliminate the tax on inheritance. He also says, if he is elected, he would like to explore consolidating state agencies to streamline government. Delegate Rob George (R-Annapolis) is expected to announce his candidacy Wednesday. “I am running for Governor to Build a New Maryland. My vision is that in the New Maryland private sector jobs are created, small businesses expand, good government is restored, children are well educated and we balance our budget without continuing the O’Malley legacy of raising taxes and fee hikes,” said George in a press release. Former Maryland Lt. Governor Michael Steele said he is also considering running for governor, the Associated Press reported. "We're looking at it," Steele told NBC News' Chuck Todd Monday. "I think we can move the state in a different direction." Steele is expected to finalize his devision by the end of the year. He served as chairman of the Republican National Committee from 2009 until 2011. Meanwhile, in Columbia, Democratic candidate Lt. Governor Anthony Brown officially named Howard County Executive Ken Ulman as his running mate. The duo made the announcement Monday at the Columbia lakefront. The pair then made their way to Cambridge for a luncheon. Their day will wrap up with a pizza party at Brown's campaign headquarters in Prince George's County at 3:30 p.m.
Brown and Ulman hope to be seen as Maryland's new generation of leadership. "I couldn't be more excited to start this Journey with you here today," Ulman said to the crowd. Ulman had been considering a run for governor in 2014 himself, raising about $2 million for his campaign. 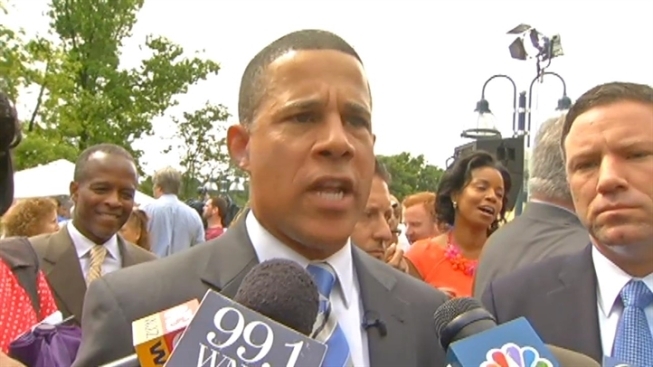 NBC4's Chris Gordon asked him why he decided to join Brown's ticket. "He's such a great man. His whole career has been about public service -- whether in the military or for our state," Ulman said. Brown had equally kind things to say about his running mate and why he chose him. "The work that Ken has done with "Healthy Howard," the work he's done to invest in public safety and public education, the work he's done with the private sector to create jobs in Howard County..."
Supporters were equally as excited about the Democratic ticket, endorsed by Maryland Gov. Martin O'Malley. LaVonne DeLattiboudere said, "I think that this is a political powerhouse to have two entities join together...with their knowledge base and political history and the concern for people of Maryland." While Craig and Brown are the first to announce their candidacies, more are expected to follow, including a bid from Maryland Attorney General Doug Gansler. The primary will be held next June and it is expected other democrats are waiting to announce their candidacy closer to the election.